I DON'T WORK FOR REALTORS - I WORK FOR YOU, THE BUYER. Do you feel uncomfortable hiring a Philadelphia home inspector recommended by your realtor? Strong Foundations Home Inspections is one of only three Pennsylvania home inspection companies in the entire state and the only Philadelphia area company that has signed a "No Conflict of Interest" pledge promising not to solicit real estate agents or their offices for business or referrals in any way, shape, or form Read our "No Conflict of Interest" Promise. Welcome to Strong Foundations Home Inspections. We are a member of the Independent Home Inspectors of North America (IHINA) and perform independent home inspections in the state of Pennsylvania on resale homes, pre-settlement inspections on new construction homes, and builders warranty inspections. We are compliant with Pennsylvania Home Inspection Law (ACT 114) and are licensed to provide home inspections in the City of Philadelphia (Philadelphia license #24376). 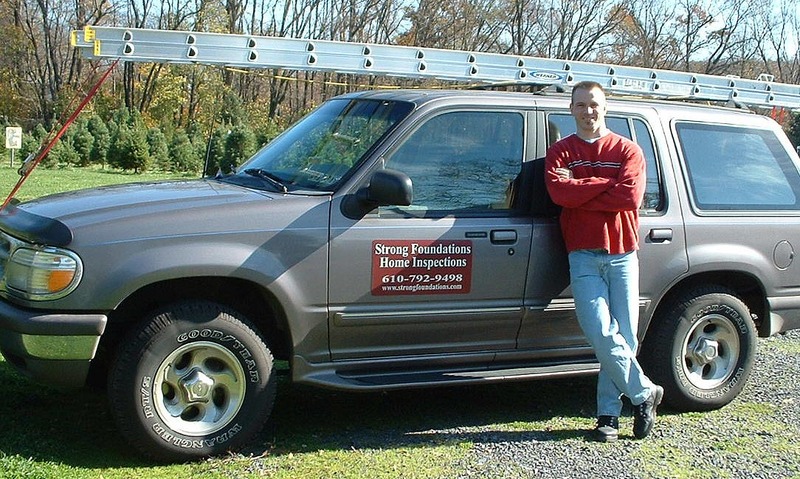 Strong Foundations is based out of Spring City in Chester County Pennsylvania. We provide home inspections in Phoenixville, Collegeville, Pottstown, Royersford, Limerick, Reading, and the surrounding six county area. We have been in business since 2003 and inspected over 2,000 houses. If you would like to schedule an inspection or receive a price quote, call us at 610-792-9498or send us an e-mail. Contact Us Today To Get Our Internet Discount Special! We are currently offering Special pricing discounts on our home inspections, radon tests, and termite inspections. Contact Us today to find out how much money you can save!. 8 Reasons Why You Should Hire Strong Foundations For Your Home Inspection Needs! At Strong Foundations, we have been in business since 2003 and have performed over 2,000 home inspections. We are admittedly picky and detail oriented when performing an inspection. This approach does not earn us many realtor referrals but that's OK because we don't work for them. We work for you, the buyer. If You Think New Construction Homes Don't Need a Home Inspection, Think Again. We found this defect during a recent pre-drywall inspection of a new construction home. 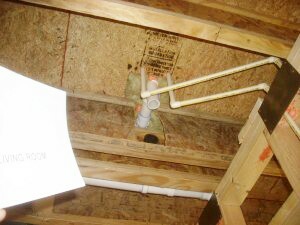 The picture shows a damaged engineered I-Joist which forms the structural base beneath the 2nd floor bathroom. The joist has been cut almost completely in half by the plumber. If the buyer didn't hire us to inspect this home, the builder would have covered the defect with drywall in the next few days. Left uncorrected, the living room ceiling would eventually begin to sag and fail under the weight of the bath tub when filled with water. In addition to this defect, we found another I-joist with similar plumber-inflicted damage in the basement. Crisis Averted: A Potentially Disastrous Fireplace Defect found. If there is one system in any house that is prone to issues and defects, it is a fireplace. 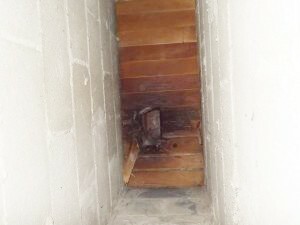 The picture seen here was taken of the underside of a brick masonry wood burning fireplace in a 50+ year old house. The view you see in this picture is from the bottom of the ash dump in the basement looking up at the underside of the firebox and hearth for the 1st floor fireplace. The installer built the fireplace right over top of the wooden subfloor and as the picture shows, the subfloor wood is charred and burnt, a near catastrophe. This fireplace was never safe for use from the day it was built and it is not usable in its present condition. But the good news is that the buyers and sellers were made aware of the situation and the fireplace will no longer be used. A non-working fireplace may detract from the value of the home but the trade-off in this situation cannot be measured in dollars. Whether you are an experienced home owner or it is your first home purchase, buying a home can be an overwhelming experience. At Strong Foundations, we will spend as much time as is necessary at your home inspection to answer your questions and help you understand the condition of the house you want to buy. Not only will we point out any noted defects but we will help you understand how things should look when done properly and how to recognize some defects on your own. No concern you may have is too small and the only silly questions are the ones not asked. The home inspection is your best opportunity to get to know as much about your new house as possible. And if you have a question or concern you forgot to mention, call us. Phone consultation is always free. When you decide to buy a house or property in the state of Pennsylvania, you will likely sign an Agreement of Sale for the property you plan on buying. Most Agreements of Sale come with either a 7 day, 10 day, or 15 day contingency clause. This clause is your window of time in which to make your final decisions regarding the purchase or non-purchase of the property. If you are relying on the results of your home inspection, termite inspection, radon test, or other inspections to assist you in making the final decisions, the time to find your home inspector is within a day or so of signing the Agreement of Sale. This will allow you as the buyer enough time to have your inspections completed and the results delivered to you. Waiting until the last minute to schedule your inspections could result in your contingency clause expiring and the loss of valuable decision making time. One of the reasons we are able to offer reasonably priced inspections is because we answer our own phones and don't pay additional monthly fees for an answering service. As a result, we may not be able to answer every call when it comes in due to our inspection schedule. However, we guarantee we will respond the same day to any messages left on our voice mail during office hours, Monday thru Friday. The housing market is currently made up of many bank owned, foreclosed, and vacant properties. The utilities such as gas, water, and electrical service are often times shut off in these houses. If you are considering buying one of these properties, you should take steps well before the home inspection to ensure that all utilities will be on for your inspection. Systems that are off or shut down at the time of the inspection cannot be properly inspected. The responsibility and costs of having utilities turned is sometimes shared between the owner of the property and you the buyer. We recommend verifying the status of the utilities in the house with your realtor and taking the appropriate steps to have all utilities turned on prior to your home inspection. If you are buying a house that has an on-site septic system, we suggest getting the septic system inspected before getting the house inspected if time allows. From our experience, on-site septic systems are often found to be undersized, outdated, or in need of replacement. The cost of a new septic system can cost $15,000 - $30,000. If a failed septic system would prevent you from buying the house, consider getting it inspected before spending more money on other services like the home inspection, radon test, or termite inspection. If you are buying a house that has an on-site well for water service, there are two typical inspections/tests that are performed to assess the conditon of the well. The first is a general inspection of the well components which should also include a water flow test. This test involves placing a load on the system and letting water in the house run for a period of time to gauge the recovery rate of the well. The second test which we highly recommend for any well is a test of the wells water quality. Since wells are replenished by underground aquifers, having water quality tested will let you know if there are any harmful bacterias or unsafe levels present in the water and whether or not a purifying system is needed. Check the Weather forecast for the day of your Inspection.